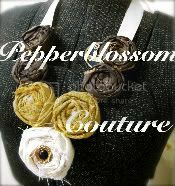 pepperblossom decor: Preview of some new items for Saturday! 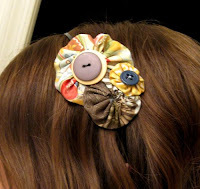 These fabulous new hair accessories! Were obsessed with these yo-yo's! Put them on anything! Necklaces, headbands, clips, cloths, phrase boards... you name it! Aren't they fun! 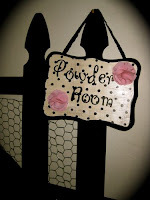 Powder Room Anyone? Looking for a fun way to spice up that hall a little? Here is a fun way to decorate and let people know where the loo is! So cute! We love it! And last but not least at all.... The cutest onesies in the world! 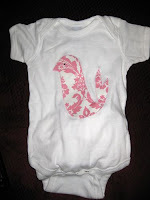 Each pepperblossom onesie has a unique peace of swarovski bling! We have seen people selling similar items for around $25! Are they nuts! Why would anyone spend that much on them although they are cute... but 25?! You can find them at pepperblossom for $13! So many different styles to choose from! Check em out at our Open houses, or a few are listed on our etsy account! Can you just imagine a cute little girl crawling around in these! How fun! Well check back for more fun surprises coming soon! See you all on Saturday! Its going to be so much fun!